Baby Playtime: How Much is Enough? New moms often ask, “How much should I play with baby?” The simple answer is, “As much as you wish to.” Babies love faces and the best time to interact with those they love is face-to-face contact times such as bath times, diaper changes, and feeding times. During those contact times, it helps to sing, talk, tickle, read, make facial expressions and use vocal variety to baby. Don’t forget to smile. Babies love facial interaction and they will naturally turn their head away when they have had enough. Try to give baby some “tummy time” for several minute periods each day. It helps baby to develop neck and upper arm muscles and it relieves pressure on the head so that the risk of plagiocephally (flat head) is reduced. Many babies don’t like tummy time, on a hard floor, so it can be helpful to put baby on parent’s chest while parent is lying down on the sofa. This counts as tummy time. Also, keep in mind that tummy time can be several minutes, several times a day, instead of a twenty-minute marathon every day. Baby carriers are a wonderful way for babies to be stimulated and entertained through the day. Baby watching you make dinner from the elevated view of a backpack is fascinating for him and is just as stimulating for his brain development as watching “educational” videos. In spite of our society’s intensive push to give early learning to young children, try to avoid worrying about how much stimulation and playtime she is supposed to be getting. If you enjoy spending time with baby, interacting with your natural enthusiasm, rest assured she is getting enough stimulation! In the last issue, we talked about toddler behaviour and the importance of child-proofing and distraction. For older children’s behaviour, problem-solving is now the first go-to discipline tool. But don’t forget, problem-solving still works for toddlers and preschoolers. Problem-solving is effective for maintaining open communication, and understanding development as well as formulating creative solutions for solving everyday problems of living together as a family. Mostly, problem-solving with young children is comprised of the parent doing most of the “solving” but when children reach ages 3-4, they can help brainstorm ideas too! Punishment is “me against you.” Problem-solving is “you and me working together against the problem.” Problem-solving teaches creativity, empathy, communication and accountability. Your child is about to run into the road. Grab and carry the child to safety. Keep enclosed in the yard or house. Discuss car safety and road safety rules. Supervise constantly around vehicles and roads. Development Tip: Children do not develop the visual acuity to judge distance and timing of vehicles on a road until aged 9. Children younger than age 9 cannot be trusted to control the impulse to run into a road to retrieve an item of interest. Your child is about to touch a hot stove. Remove the child from the stove. Supervise closely in the kitchen and keep the child occupied. Explain in simple words that stoves are dangerous. Development Tip: Children must be supervised around cooking appliances until age 12, when they can comprehend the cause and effect of safety rules. Your child runs away in the supermarket. This could be a fun game for the child, but not for you. Corner and grasp the child, explain that this is not a game, and that you will not play chase in a store. If necessary, head home. Distract with a toy or snack. A shopping cart is harder to escape from than a stroller. Re-think grocery shopping. Could someone mind your child while you shop? Could you shop at night while your partner is home? Development Tip: This is a temporary phase. Your child will stop running away from you by about age 5. Your child is in a whining stage. Give the desired item instantly when the normal voice is used. normal” voices so they can tell the difference in voice tone, pitch, and variety. Pat your head and pretend you can’t “receive” when the tone is whiny. Pretend that the reception improves when the request is less whiny. Developmental Tip: Most children stop whining around age 8. Your child draws on the wall. Provide paper, and explain that drawings happen on paper, not walls. Get two cloths and a bucket of soapy water. Wash the wall together. 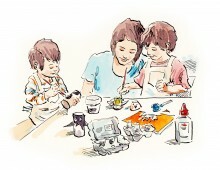 Collect pens and crayons until you have time to supervise drawing. Development Tip: Childproofing is necessary until about age 4 when children understand the “why” reason behind the behaviour they are not allowed to do. It’s time to go, and your child is unwilling to leave. Catch and carry them out. Developmental Tip: Children learn to accept leaving a place of fun by around age 7. Two children are fighting over a toy. Encourage sharing, or taking turns, or flipping a coin, or picking names from a jar, or playing Rock, Paper, Scissors. Warn that there will be a winner and a loser, and confirm that they understand and accept that. Offer the first player a shorter time, and the second player a longer time. Hold the toy until an agreement is worked out that both children are okay with. Developmental Tip: Siblings will have conflicts over many issues. Teach siblings to resolve conflicts respectfully, to help them to resolve conflicts in their future family and employment relationships. Your child throws food onto the floor. Calmly, get a bucket of soapy water and cloth, and clean up the mess together. If your child is too upset to clean up the mess, postpone the cleanup until the child has calmed down. Developmental Tip: Children are better able to manage their frustration around age 4. Your toddler has toilet accidents. Keep up encouragement. Praise any tiny success. Show the child how to help you clean it up. Development Tip: Toilet training involves lots of misses. Most children train by age 4. Your child denies eating cookies – but his lips are smeared with crumbs. Reward your child for the truth. Promise that you will never punish if your child tells the truth. Developmental Tip: Denial at the toddler age is not serious, since toddlers are in the developmental stage of “wishful” and “magical” thinking. Most children understand the abstract concept of lying by the age of 6. Your toddler rips pages from a valued book. Substitute a magazine that you don’t value. Get the child’s attention on the substitute and then gently pry away the valued book. Childproof – don’t leave books lying around. Work with your toddler to repair the book together. Developmental Tip: Children are more respectful to items around age 4. Your toddler hits, pushes or bites a sibling or another child. Provide attention, cuddles and comfort to the other child. When the toddler has calmed, take the toddler to the child, and demonstrate how to make up – give a kiss, hug, say “Sorry”, or offer a toy. Give the toddler extra attention every day, though not right after the “hit”. Take her out on “dates” and lavish special attention on her so she can acquire attention in positive ways. Notice and praise when you see the toddler doing something nice for the other child. Don’t leave siblings together unsupervised until the youngest child is 6. Developmental Tip: Biting, pushing and hitting are typical impulses up to about age 4. As children grow up, they become less inclined to use violence upon each other. By age 7, hitting becomes rare, and by age 12 should end, as verbal skills improve. Your toddler runs away when you try to change diapers. Catch and scoop up your child. Don’t waste time – be fast! Talk, sing, tickle and make diaper-changing a fun time. Keep a box of interesting toys by the change station, to keep his hands busy. Developmental Tip: Some toddlers are patient, and some are not. Children become more cooperative around age 4. Your child smashes another child’s sand castle. Ask your child to apologize to the other child. If your child refuses, say to the other child or parent: “I’m very sorry, but my child doesn’t have the words right now to say sorry”. Model an apology that you give to the parent. Take your toddler away to calm down. When your toddler is calm, offer to re-build the castle together. Encourage an apology, but don’t force it. Developmental Tip: Children handle anger more effectively around age 4, especially if encouraged with positive alternatives for expressing frustration and anger. Your preschooler ignores your requests to pick up toys. Make pick-up a game in which you both participate. Developmental Tip: Until about age 12, most children require some direction, instruction, encouragement and help for most tasks. You are trying to work, and your toddler pesters you to play. Play with your toddler for 15 minutes of your full attention. Interest the toddler in a toy, movie or activity, and get back to work. Join or build a network of parents of similar-aged children. Arrange play-dates. Rotate and pack away toys. Bring out a “new” toy box for each day. Postpone your work until naptime. Developmental Tip: By age 3, children can play well with other children on play-dates, which can free up your time. Your toddler says “NO!” to your requests. Offer choices between two or three acceptable options. Reduce your use of the word “No”. Alternatives include “later”, “not now, but you can have…”, “Let me think about it”. Don’t expect a child under age 3e to share possessions. Childproof your surroundings for safe exploration and discovery. Development Tip: The “no” stage lasts from about age 1.5 to 4 years. This is a normal developmental stage for healthy children. Children naturally become more cooperative during the preschool stage. Your toddler is upset that you are leaving. Leave a special item for your child to take care of while you are away. Develop a leaving routine: a special hug, wave. Kiss goodbye, and leave your child in the arms of the caregiver. Don’t sneak out! If you sneak out, your child will feel insecure, and will become clingy. See if your caregiver can come to your house. Try to establish a routine: the same time, same place, same caregiver. Choose childcare arrangements with consistent caregivers, for development of attachment (and don’t worry, you will never be replaced!). Developmental Tip: Separation anxiety begins around age 1, peaks at age 2 and fades by age 4. Provide healthy foods from the four groups. Offer three meals and three snacks per day, about two hours apart. Leave the food out for twenty minutes and then clean up. Do not punish for not eating. Offer water \between meals and snacks. Serve milk at meals. Allow toddlers to explore food with their fingers. If your toddler starts throwing food, meal time is over. Food jags are normal, in which the child eats only peanut butter and jam sandwiches for three weeks. That’s okay. As long as it’s a healthy food, don’t worry about nutritional intake. It takes 15 tries to accept a new food. Have a one-bite routine. If the child spits it out, don’t worry, and don’t make it a power struggle. Children have sensitive taste buds, and their preferences will change as they develop. Your toddler won’t stay in bed. Develop a routine – snack, bath, pyjamas, teeth, book, prayers, bedtime snuggle. If your child keeps getting up, consider two “bedtime excuse” tickets. Two tickets can be used for requests such as a drink, extra kiss, a cuddly toy. Each time, lead the toddler back to bed without talking, and close the door. Spend extra time to talk, read, cuddle and listen as part of the bedtime routine. When you find a routine that works, keep it up. Developmental Tip: Most children under age 12 try to put off bedtime, because they don’t want to separate from their parents, or to end their day. Parents find that a regular bedtime routine develops cooperation. Some families choose co-sleeping – however the safety of children under the age of one might be a concern. For more ideas on non-punitive discipline for all stages of childhood, check-out Discipline Without Distress. For more information on Judy Arnall’s suggestions for effective discipline, click Webinars at http://www.professionalparenting.ca to register. “Your kids fight?” people ask incredulously, when I am presenting a parenting workshop. “Of course!” I answer. “Every person in a love relationship fights.” I prefer to say that every relationship has conflict. It’s normal and inevitable to disagree. However, the determining factor in the quality of the relationship is how the fights get resolved. Conflict happens between spouses, partners, relatives, friends, neighbours, co-workers, group members, governments, countries and everyone else. Why would the sibling relationship be different? You know it’s going to happen. But like many things in parenting, it’s better to know what you are dealing with and have some planned strategies to try. The underlying feeling is, you guessed it! Boredom! What better way for your child to have some fun, than to bug someone who he knows is going to give him a great reaction? Unhelpful parent strategy: Ignoring the fight. Punishing the child. Helpful parent strategy: Give your child a new, interesting activity that is work, fun or something to do with you or someone else. Casually separating the children also helps, but don’t make it an enforced time out. Unhelpful parent strategy: Giving negative attention in the form of a punishment, time-out, or time spent playing judge and jury. Helpful parent strategy: Avoid punishments. Ignore the fighting, but give more individual time and attention later when the fighting has subsided. Schedule a date night or time alone with just that child. Acknowledge pleasant sibling interactions when they occur. Your child is feeling victimized, angry, frustration, or injustice. Unhelpful parent strategy: Playing judge by directing who the perpetrator and victim was, and how restitution should be made, according to how you see things. Taking away fought over toys or privileges. Punishing both children regardless of the issue. Helpful parent strategy: Avoid punishments. Accept and acknowledge each child’s feelings and point of view and try to help them express it to the other child. Help them come to solutions, that both children will agree to. Help them generate the ideas, rather than you do it for them. In addition, give each child input in family rule formation. Teach problem solving skills and then coach them through the process. Teach anger management strategies and self-calming techniques later when everyone has calmed down and the issues are resolved. Your child may be feeling accumulated hatred and resentments toward their sibling, and may also be feeling jealousy, unworthiness, unloved, victimized, unvalued, or discarded. Unhelpful parenting strategies: Group punishments, taking away toys or privileges, comparisons, and labelling. Being a judge without hearing or seeing the whole story. Helpful parent strategies: Notice generous, loving, caring, behaviour and point it out to the children in specific language. Avoid labels and comparisons. Love each child best. Encourage accomplishments and efforts of each child. Avoid punishments of any kind to anybody. Accept and acknowledge all feelings of each child, even if you don’t agree with them. Give a lot of individual attention and time to each child. How you deal with sibling rivalry determines how the children treat each other. If you punish them, they will punish each other. If your approach is to work on “solving the problem in a mutually respectful way”, they will also take the same approach. And remember, you do not have to maintain equality at all times. Just commit yourself to giving only what each child needs. One child will bound to get more, because they need more, but the important point is that each child feels secure knowing that when he needs something, it will be given to him. In “Between Parent and Child”, Dr. Haim Ginott states: “We do not love all our children the same way, and there is no need to pretend that we do. We love each child uniquely, and we do not have to labour so hard to cover it up. The more vigilant we are to prevent apparent discrimination, the more alert each child becomes, in detecting instances of seeming inequality. Unwillingly, we find ourselves defensive against the child’s universal battle cry, ‘no fair!’” Celebrate your children’s fights! What a great opportunity to teach relationship skills and conflict resolution skills that they are bound to need later in life. “Your kids fight?” people ask incredulously, when I am presenting a parenting workshop. “Of course!” I answer. “Every person in a love relationship fights.” I prefer to say that every relationship has conflict. It’s normal and inevitable to disagree. However, the determining factor in the quality of the relationship is how the fights get resolved. Conflict happens between spouses, partners, relatives, friends, neighbours, co-workers, group members, governments, countries and everyone else. Why would the sibling relationship be different? You know it’s going to happen. But like many things in parenting, it’s better to know what you are dealing with and have some planned strategies to try. How you deal with sibling rivalry determines how the children treat each other. If you punish them, they will punish each other. If your approach is to work on “solving the problem in a mutually respectful way”, they will also take the same approach. And remember, you do not have to maintain equality at all times. Just commit yourself to giving only what each child needs. One child will bound to get more, because they need more, but the important point is that each child feels secure knowing that when he needs something, it will be given to him. Celebrate your children’s fights! What a great opportunity to teach relationship skills and conflict resolution skills that they are bound to need later in life.